A group of talented authors have compiled 13 amazing tales to give you a different perspective on holiday stories this season. FRIGHT BEFORE CHRISTMAS: 13 Tales of Holiday Horrors will have you smiling just before you lose your breath when a twist throws you off ground. Each author has masterfully penned a tale relating to the Christmas holiday, but with a naughty twist. These tantalizing tales include such stories as: Machette Santa by Medeia Sharif, North Pole Coal by Patrick Hueller, Frosted by Ally Mathews, and The Tell-Tale Scarf by Judith Graves to name a few. The stories will have you rethinking how you relate to holiday activities. Geared toward middle grade readers, this anthology will entertain and delight readers of all ages. 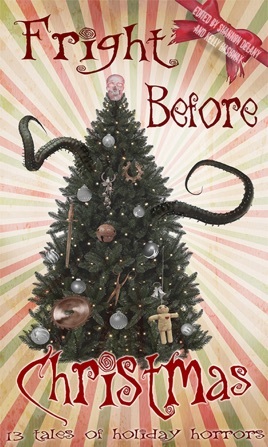 FRIGHT BEFORE CHRISTMAS will become a family favorite read for the holidays. These stories will draw you in and hold you captive until the very end.